The Peoples Democratic Party has charged the All Progressives Congress and the Presidency to stop “making mockery of governance with premature celebration of imaginary achievements,” except if the intention is to set up President Muhammadu Buhari for national and international ridicule. The party said it was embarrassing that the APC and aides of President Buhari decided to invade the minds of Nigerians with propaganda and tissues of lies instead of assisting the President, who was inaugurated three weeks ago, to settle down, form a government and deliver his campaign promises to Nigerians. It wondered why it was difficult for the APC-led Federal Government to appoint Secretary to the Government of the Federation and the Chief of Staff to the President. The opposition party was reacting to the claim by the ruling party, which, through its National Publicity Secretary, Alhaji Lai Mohammed, lambasted the PDP for the manner in which it claimed the party ruled the country for 16 years. Mohammed said for 16 years, Nigerians gave the PDP the benefit of the doubt to move the country forward, but instead, the party put Nigeria in reverse gear at a high speed, spinning it towards a doomsday that was only averted when Nigerians showed the then ruling party the red card. He said this act was what necessitated President Buhari to continuously seek the country’s highest political office, so he can help put the country on a forward march again. Mohammed added that if the country had been well managed, President Buhari will not, at 72, be crisscrossing the whole world seeking solution to Nigeria’s problems, it said. He had said, “APC said within three weeks of his inauguration, President Buhari has succeeded in returning Nigeria to the comity of nations, to such an extent that world leaders are now so eager to engage him on how to assist his country in key areas, including security and the fight against corruption. But the PDP National Publicity Secretary, Chief Olisa Metuh, in a statement in Abuja on Thursday, said the nation and democrats world over were thoroughly embarrassed by the alleged lists of achievements made public by the party. He said this action had further exposed APC’s lack of capacity and direction as well as its inability to draw a line between propaganda by an opposition party and disseminating of credible information as a party in government. 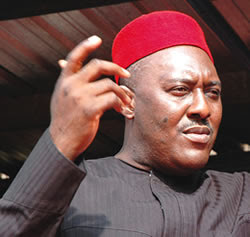 Metuh said, “How can a serious government start shouting achievements and make bogus claims on the fight against terrorism when the effort is apparently losing steam as insurgents, who had already been pushed to the verge of surrender in the Sambisa forest by the Goodluck Jonathan administration, are now surging back into the country under the APC-led government? “How can a serious government shout achievement based on pledges by foreign interests, a dangerous slide towards neo-colonialism, instead of settling down to galvanise bequeathed resources and potentials that have already placed our great country as one of the fastest emerging economic and political powers in the world? He wondered what the APC was celebrating, alleging that due to its naivety and delays, key sectors of the nation’s economy were dangerously drifting with a perilous crippling of foreign and domestic investments including activities in the money and capital market sectors. Metuh said the APC should not, by any means, attempt to use its flimsy list to divert attention from its numerous campaign promises for which the people will be holding them accountable. “Finally, we advise the Presidential spokespersons to allow Nigerians to judge the President as events and time will prove exactly the taste of the old wine,” Metuh added.